Illuminated by the rising sun and partially enveloped in cloud, Boney Mountain’s Western Ridge looked so inviting I thought about abandoning my planned run and climbing the ridge instead. Pt. Mugu State Park is a great place for long, self-supported trail runs. The scenery is superb, the trails are generally in good condition, and water is usually available in several locations. 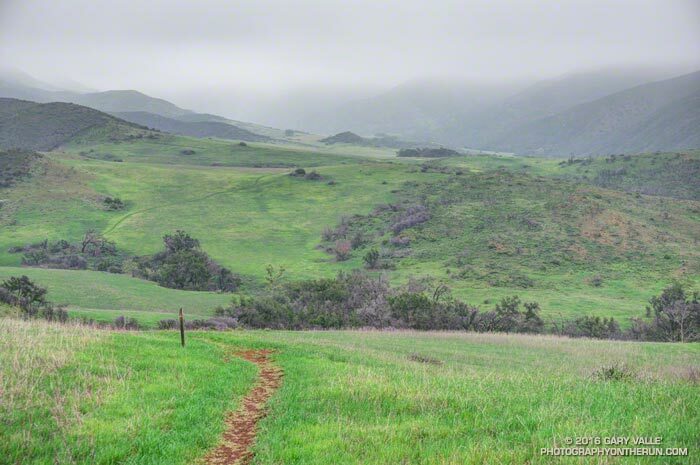 The marine layer kept the temperature cool for most of the run, but the sun finally broke through as I ran up Sycamore Canyon on the Two Foxes trail, on the way back to the Wendy Drive trailhead. Although much of the run was overcast, a good selection of wildflowers added some bright color to the cloudy day.